GreenSportsBlog’s TGIF News & Notes reflects that full calendar, with tennis, basketball, and football on the docket. Until Serena Williams’ dispute with the chair umpire in her straight set defeat to Naomi Osaka at the US Open final became an international hot topic, excessive heat was the dominant storyline during the recently completed tournament in Queens. The ATP, the governing body of the men’s pro tennis tour, took the unprecedented step of instituting a new rule, after the tournament began, that allowed players to go to the locker room for a 10 minute cooling break after the third set (women’s players already were permitted such a break after the second set). With on-court temperatures reaching as high as 130 degrees Fahrenheit (54.4 degrees Celsius), it was common to see players draping large ice wraps over their shoulders during one minute changeover breaks. Eventual men’s champion Novak Djokovic was almost felled in two early round matches by two implacable foes: the oppressive afternoon heat and humidity. Night matches were affected: Unheralded John Millman shocked Roger Federer in the Round of 16 on a particularly hot, sticky, stuffy evening. While ESPN covered the heat/humidity story during the tournament’s fortnight — there was no way the cable-caster could avoid it. After all, players were wilting and fans stayed away from the sunny side of Billie Jean King National Tennis Center venues in droves. But ESPN did not get delve into any potential links between the extreme weather at the Open and climate change. And, while Federer cited heat and stuffiness as the main reason for his upset loss — “It was hot. It was just one of those nights where I guess I felt I couldn’t get air; there was no circulation at all.” — he didn’t “go there” on climate change. Thankfully, reporter Kendra Pierre-Louis of The New York Times’ fantastic “Climate Fwd” newsletter, did make the climate connection for millions of readers on September 4 in “Roger Federer Is Tough to Beat. Global Warming Might Have Pulled an Upset.” Her particular focus was the relatively unsung trend of increasingly hot nights. The effects on the human body of exercising in high temperatures with high humidity can be calamitous, reported Pierre-Louis. That’s because sweating, “a key cooling mechanism,” gets stymied. When the air is excessively humid, sweat drips instead of evaporating. And that eliminates the cooling effect on the body. GSB’s Take: As a lifelong resident of the New York City metro area, let me tell you, a nighttime heat index in the 90s, a rarity back in the 1970s-80s, is becoming all too common in July and August. While heat and humidity played a major role in Federer’s exit from the US Open, such extreme weather is much more perilous for non-athletes. And until humanity, non-athletes and athletes alike, gets its act together on a massive decarbonizing effort to break climate change’s serve, extreme heat and humidity that makes exercise — among many other activities — risky will become the norm. I wonder if, as the effects of climate change get more severe, tournaments like the US Open and Australian Open, which are played in the heat and the humidity of the summer, will move towards more temperate times on the calendar. When LeBron James joins the Los Angeles Lakers for his first training camp in Los Angeles later this month, he’ll be doing so at a training facility with a new rooftop solar array. 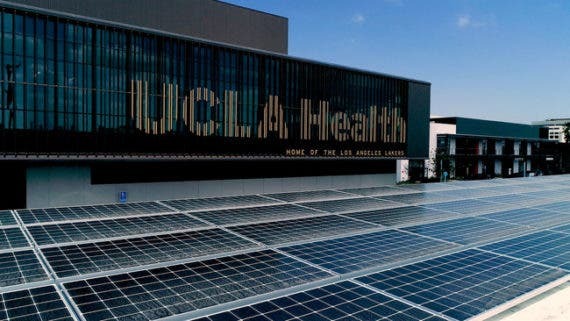 According to a story by Kyle Field in the September 2 issue of CleanTechnica, Vaha Energy installed a 171 kW system comprised of 456 LG Solar panels on the roof of the team’s new LEED Platinum, 120,000 square foot UCLA Health Training Center in El Segundo. “The system is expected to save about $38,000 per year, on a rate of 16 cents per kWh,” wrote Field. Vaha Energy projects that the team should be able to pay off the system in a relatively quick four years. The Lakers plan to communicate their greening efforts at UCLA Health Training Center to fans — the cozy venue seats 900 — during team practices and at home games of the NBA G League’s South Bay Lakers. GSB’s Take: The move by the Lakers to solar-ize their new UCLA Health Training Center is, of course, welcome news. As costs of solar continue to go down, we can expect more such on-site solar installations at sports venues. It says here that the Lakers would’ve done even better to install solar panels atop car ports in the parking lot, in addition to their rooftop array. That way, fans could not miss the Lakers solar play — the panels on the roof are not easily visible to passersby. Oh yeah, it would be cooler than cool if LeBron agreed to be featured in video messaging about the Lakers’ solar installation. A crowd of 76,000+ at Broncos Stadium at Mile High in Denver saw the home team open their 2018 NFL season Sunday with a come-from-behind 27-24 home win over the Seattle Seahawks. Fans 21-and-older were able to urge the Broncos on by waving orange rally towels, presented by Bud Light, made from 100 percent recycled materials from earlier Broncos games. Believed to be the NFL’s first promotional giveaway made from fully recycled materials, the towels are made from plastic Coke bottles from Broncos Stadium. The 100% recycled icon is located on the lower left of the towel, clearly visible to fans. Coke bottles get hauled from the stadium to Waste Management’s Denver Recycling Center. The bottles are then delivered to a Materials Recovery Facility and sold to a plastic processing plant. The processing plant breaks the bottles down into flakes or pellets and sells them to yarn manufacturers, who in turn sell the yarn to fabric weavers and knitters around the world. Fabric makers sell the fabric to cut, sew and decorating plants — in this case, G&G Outfitters, a Maryland-based NFL licensee — where the towels are produced, decorated and shipped back to Denver for the game. GSB’s Take: I love this promotion — a towel that is clearly marked as 100 percent recyclable given out to many thousands of fans. But how cool would it be if the Broncos encouraged fans to bring their towels every time they come to a game? Show your towel at four games and you get a free Bud Light. Or some other idea. No matter the promotion, the team would be emphasizing the important sustainability principle of reuse as well as recycling.